How many Avengers can you count? The Fantastic Four become caught in a struggle between the Skrulls and the Xandarians in the Andromeda Galaxy. When the Sphinx arrives in Nova's starship and absorbs Xandar's living computer, the FF pursue him back to Earth, while Nova and his allies defend Xandar from the Skrulls. Reed constructs a robot assistant, HERBIE. The FF convince Galactus to save Earth from the Sphinx. Terrax the Tamer becomes Galactus' new herald. The FF help SHIELD capture Godzilla. Reed sends him into prehistoric times where he encounters Devil Dinosaur. When Godzilla returns to the present, the FF ask for aid from the Avengers. 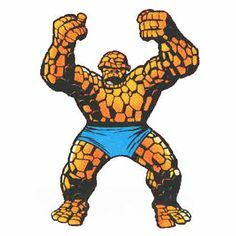 The Machinesmith uses the Yancy Street Gang to attack the Thing. The Thing travels back to 1962 in an attempt to cure himself at an earlier stage of mutation, but only creates a divergent timeline. Ben Grimm, Thundra, Deathlok, Marvel Man (now Quasar), Black Goliath (now Giant Man) and Wundarr (becoming the Aquarian) are involved in a plot by the Roxxon group to destroy Project Pegasus. Screaming Mimi (later Songbird) surfaces as one of the Grapplers. Thor depletes the time-spanning powers of his hammer Mjolnir when he helps save the Space Phantom's home planet. Thor encounters the Celestials in their New Mexico base. The Deviant Ereshkigal surfaces. Back in the United States, Thor, Ikaris, Thena and Sersi fight Deviants below NYC. Thor encounters the One Above All in the Celestial mothership, while Odin forms a pact with Zeus and the Olympians to oppose the Eternals. Odin's Eye reveals to Thor the existence of previous Asgardian Ragnarok cycles and the deaths of Thor's former mortal incarnations as Siegmund and Siegfried, as well as the Sky-Fathers' history of struggle with the Celestials. Odin draws all the souls of Asgard into the Destroyer to confront the Celestials, with the Eternals' Uni-Mind at its side. The Celestials destroy them both, and Thor is defeated. Earth is saved by the elder goddess Gaea when she offers the 12 Young Gods which the various Earth-Mothers (spouses to the Sky-Fathers) have been cultivating over the last millennia. The Celestials leave Earth with the chosen group. The Asgardians are resurrected (including Balder, whose hair is now white) with the help of Zeus, Osiris, Yu-Huang, Vishnu and other deities of Earth. Ex-con Scott Lang becomes the new Ant-Man when he discovers Henry Pym's old costume. He uses it in order to save his daughter Cassie's life. Stark's friend from the Vietnam war, James "Rhodey" Rhodes, surfaces as Stark's pilot. SHIELD attempts to take over Stark International in order to return it to weapons development. Justin Hammer takes control of Iron Man's armor and frames him for murder. Iron Man battles an army of minor super-villains dependent on Hammer's company. Butler Edwin Jarvis resigns (temporarily) with a strangely scathing letter. Tony Stark is driven to alcoholism by his professional and personal problems. 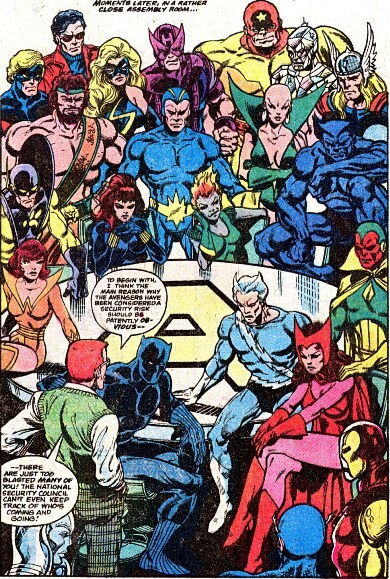 Henry Gyrich puts restrictions on the Avengers' membership roster. Ms Marvel and the Falcon join the Avengers (in time to fight the Absorbing Man). When Quicksilver and the Scarlet Witch travel to Wundagore Mountain to investigate their origins, Modred the Mystic, controlled by the Darkhold, attacks. Wanda becomes possessed by the elder god Chthon. When the X-Men aid Sunfire in Japan, Logan (Wolverine) meets future love Mariko Yashida. In Canada, Vindicator and Department H’s superteam, Alpha Flight (made up of Northstar, Aurora, Shaman, Sasquatch and Snowbird) try to capture Wolverine again. Jason Wyngarde (Mastermind) begins his exploitation of Jean Grey's dark side. Xavier travels to the Shi-Ar throne world. Proteus (Mutant X), Dr. MacTaggert's reality-altering son, attacks the X-Men on Muir Island. Mary Jane Watson is possessed by the spirit of Red Sonja when Spider-Man battles the Hyborian Age wizard Kulan Gath. A mutated clone/virus of the Jackal, calling himself Carrion, hunts Peter Parker. (Parker also begins graduate school at E.S.U. as a teaching assistant). Spider-Man meets flirtatious thief Felicia Hardy, the Black Cat. Seconds from killing Spider-Man, the Kingpin retires from crime at his wife Vanessa's urging. Despite being temporarily without his powers, Spider-Man rescues Aunt May from the resurfaced burglar who killed his Uncle Ben. When Sharon Carter seemingly dies at the hands of Dr. Faustus, Captain America decides to change his life and moves to Brooklyn Heights. Spider-Woman encounters the fabric-manipulating mutant, Gypsy Moth. Spider-Man, visiting LA, makes Spider-Woman's acquaintance. The Galadorian cyborg Spaceknight ROM battles Dire Wraiths on Earth. ROM is befriended by Brandy Clark. Some years prior, after defeating an invading Dire Wraith armada, the Galadorians send Spaceknights to other planets to hunt remaining Dire Wraiths. The Shogun Warriors, giant piloted robots maintained by the alien Followers of the Light, battle the Lord Maur-Kon and Dr. Demonicus' giant cyborg monsters. Quincy Harker dies when his wheelchair explodes, destroying Castle Dracula and killing Dracula (temporarily). Daredevil and the Black Widow face Bullseye, Turk and Eric Slaughter's men. Bullseye goes insane. The Red Skull, Arnim Zola and the Hate Monger (Adolph Hitler) double-cross each other while attempting to create a new Cosmic Cube. Shang-Chi encounters the weapons master Zaran, an ally of Shang's sister, Fah Lo Suee (now allied with MI-6). Shang-Chi pursues the forces of Fu Manchu to South America, Casablanca (and Rick Blaine) and New York City, where Fu Manchu attempts to detonate a nuclear weapon. When Baron Karza usurps Homeworld from Prince Argon in the Microverse, Commander Arcturus Rand and the Micronauts flee to Earth. Captain Universe appears and aids the Micronauts when Karza arrives on Earth. Rann and his crew return to the Microverse and with the aid of the Acroyear Worldmind and the Enigma Force, defeat Karza.